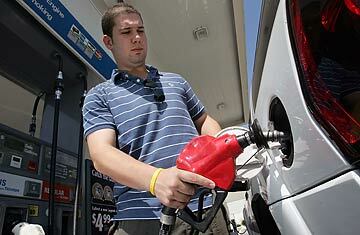 A man pumps gasoline into his car at a Chevron filling station in San Francisco, California. Say what you will about President George W. Bush. But he is a savvy enough politician to recognize that with a political stinker of a war at his back and a chops-licking Democratic majority in front of him, he had to offer up something in tonight's State of the Union address to buy a little good will. And that is exactly what he did with his decidedly out-of-character calls for better fuel economy, stepped-up production of alternative energy and a whole pupu platter of green-sounding goodies. It was enough to make you wonder if the war President steeped in Texas oil has suddenly become a bit of an eco President. Don't count on it. But don't count it out either. The President signaled that this speech would mark a new environmental direction for him both with something he said and something he didn't say. The thing he didn't say was ANWR  or Arctic National Wildlife Refuge. That's the place the Administration and the energy industry have wanted to get their drills into for years in order to boost domestic energy production. It's also the place environmentalists have been fighting just as fiercely to keep off limits. The symbolic significance of the battle always far exceeded the relatively small amount of oil locked up there, and the President's omission of any mention of ANWR tonight was his first admission that this has become a losing hand for him. What Bush did say tonightloudly, clearly and in a more auspicious venue than he ever had beforewere the words "climate change," acknowledging that the battle to reverse it must lie at the center of everything the U.S. does about energy from now on. So what then exactly does he intend to do? For one thing, the President said, he wants to see us diversify our energy choices, greatly expanding the use of clean coal, solar, wind and nuclear power and biofuels. He also wants to see stepped-up research into improved batteries for hybrid cars. All this sounds fine, but it's also a little like campaigning for delicious, low-fat cake. Who's going to disagree? Greens love anything clean and renewable and have even, for the most part, come around to the virtues of nuclear power, providing strict safety standards can be maintained and someone can figure out what to do with the waste. The energy industry loves nukes and clean coal, and if they have to make a little room at the table for windmills and solar panels, well, that can't hurt too much. Plus, Bush also called for doubling the size of the nation's strategic energy reserve, boosting oil demand by putting the government in line for a massive fill-up on the federal credit card. What the President didn't do after all this ambitious call to arms was put forward any serious ideas  or even any unserious ones  about how to make it happen. Remember all that talk about hydrogen cars? Get yours yet? No, and you're not likely to for a very long time either. More surprising, not to mention more encouraging, was Bush's announced goal of reducing gasoline use by 20% in 10 years  the equivalent of three-quarters of all the oil we import today from the Middle East  and supplementing this savings by flowing 35 billion gallons of renewable fuels into the national energy pool by 2017. That's five times the current renewable fuel goal. All of this would be a bold call for any President, all the more so for one who came so late to the conservation game. But again, the substance is lacking, at least so far. It's one thing to call for a 20% savings in fuel; it's quite another thing to demand the hard, politically costly choices to make that happen, such as a pump tax with real bite or a significant increase in mandatory mileage standards. Bush did call generally for fuel economy improvements, but if he really wants them he doesn't have to request them; he can, for practical purposes, regulate the new rules into being. If he doesn't, it's because he doesn't want to, at least not yet. Still, in the green arena, Bush has always been a President you have to grade on a generous curve, and in that respect, tonight's speech earns him a solid B. Perhaps his apparent green conversion is just a calculated ploy to win some much-needed good press. But it's also true that the last two years of a badly cratering Presidency can be a time of unexpected clarity; the less you have to lose, the less you have to fear. And the first step in tackling anything as scary as global warming is admitting you have a problem in the first place.